Some online and mobile poker sites now allow new players to try their software for free without having to make a deposit. If you create an account, they will instantly credit your account with free money to use at the real money gambling tables. As competition intensifies between the ever growing number of mobile poker rooms, some sites have opted to give their new players an instant bonus, so they can play at the cash tables for free without having to make a deposit. To try any of the apps listed on this page for free, all you need to do is create an account and log-in from your iPhone, iPad, Blackberry or Windows Phone device. In addition, at the bottom of the page we offer a useful guide to both online and mobile poker bonuses that explains the various terminologies used to help you make the best decision possible. mFortune are the UK's largest mobile casino. They've now branched into the world of mobile poker with a surprisingly good Texas Hold'em app that is compatible with virtually EVERY type of smartphone or table, including Android, iOS, Amazon Kindle Fire, Blackberry, Sony Ericsson or Windows Phone. 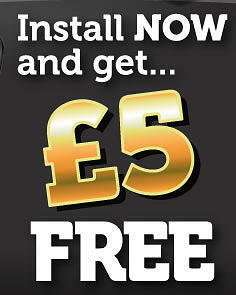 They are so confident that you will be impressed with their poker app that they are offering every new player £5 completely free for just downloading the app. When you log-in for the first time, £5 will be waiting in your account that you can use to play at the real money Texas Hold'em tables. If you win, you get the keep the cash. When most of us started playing poker online we were attracted to the various poker bonuses being offered by various rooms which promised 200% match bonuses up to $5,000 just for signing up. Surely it couldn't be that easy to double your initial investment? Well sadly it isn't. While some gambling bonuses offer real value to new players, many are extremely hard to claim and are just traps to get new players to register. Anyone who has ever read the various Terms & Conditions that go along with bonuses know that you would need to be a barrister to understand all the legal jargon that they contain. Quiet often many unscrupulous poker rooms create so many barriers and requirements that it makes it effectively impossible to benefit from their sign-up offers. Sadly all that glitters is not gold, so in this guide we hope to offer you some useful information that will help you distinguish between the genuinely beneficial bonuses and the complete turds that you should avoid at all costs. It's important that you understand exactly what each room is offering so that you will be able to claim your free cash and withdraw your winnings at a later date. WHAT IS THE DIFFERENCE BETWEEN A NO DEPOSIT & A DEPOSIT MATCH BONUS? These tend to be the 2 most popular type of sign-up promotions that poker sites offer so it's important to understand the difference between both. Firstly let's look at the no-deposit bonuses that are listed at the top of this page. Like the name suggests, these bonuses do not require a player to deposit any money before they can take a seat at the real money tables and start playing for cash. They typically range from £5 to £10 so it's unlikely that you'll make your fortune with such a small starting bankroll but they do offer new users a way to test the poker software before they decide whether they'd like to lodge money in their player account. Some mobile poker rooms will instantaneously provide you this free starter cash just for going to the trouble of downloading their app and filling in the registration form. Others may require you to provide a valid credit card number just to ensure that the same person doesn't keep registering in order to take advantage of their generosity. If you are a shark and chew up the soft competition, typically you will need to make a deposit before you will be allowed to make a withdrawal lager than the initial no-deposit bonus. The second type of bonus we'd like to discuss is the deposit match bonus. Pretty much every online bookmaker, casino or poker room advertise deposit bonuses to attract new players. These can vary in size from £10 to £10,000 so it's important to understand the fine detail here if you want to make the most of these offers. The first thing you need to look at is the percentage match. If it's 100% then they'll double your initial deposit. If it's a 200% match bonus and you deposit $100, you'll receive an additional $200 etc. It's important to understand that these bonuses are not credited to your account immediately. Instead they are added to your bankroll in smaller increments of maybe $20 every time you have earned a certain amount of bonus points by playing cash games or by entering tournaments. Once you've met the necessary requirements and your bonus dollars are released, you are then generally free to withdraw or do what you like with the bonus cash. These type of bonuses are generally more commonly offered by iPad casinos but some iPad poker sites also offer their players reload bonuses as a reward for continually playing with them. They work in a similar way to the initial deposit bonuses expect they are also open to existing iPhone, iPad and Android customers. One day a week you may receive an e-mail informing you that you will receive a loyalty bonus providing you make a deposit on a particular day or within a certain time frame. These are generally used to entice players to play play a few hands on their smartphones or tablets midweek when the rooms are a little quieter. 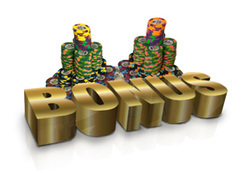 iPad poker rooms also use these type of bonuses to entice players back to their tables who haven't played for a while. WHAT ARE REFER/INVITE A FRIEND BONUSES? Everyone knows that word of mouth is one of the best forms of marketing whether you are in the restaurant, grocery or gambling business. If you are happy with the particular iPad sports betting, casino or poker app that you are using, these bonuses are used to incentivize you to tell your friends about them. All you need to do is provide your friend with a personalized bonus code and when they sign-up and make a deposit, you will receive a cash reward from the Android, Windows Phone or iOS poker site. The time allocated for a new players to claim their bonus differs from room to room. Most iPad poker players get somewhere between 1 and 3 months to play a sufficient number of hands to clear the entire bonus. When choosing a new mobile poker room, it's worth doing a few calculations to figure out how many hands on average you play every week to see if you can realistically claim all your welcome cash. We've just touched on some of the main types of iPad bonuses here. Many iPad compatible sites also offer free draws to win holidays or cars, tickets to compete in tournaments and even all expenses paid trips to the the WSOP. In our resources section we've written an article title Poker Bonus Tips that explains in far more detail how each iPad poker apps bonus works, so please have a read in order to get the most bang for your buck.